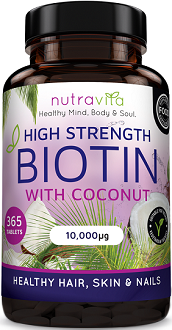 Today we review Biotin with Coconut Oil manufactured by Nutravita. 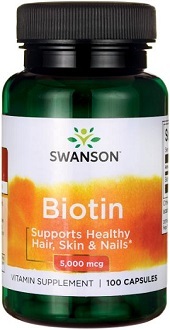 This supplement claims to play a key role in supporting the health of your skin, nails and hair. 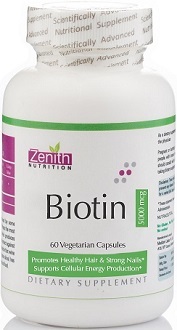 Biotin is part of the B vitamin family and essentially helps your body to break down carbohydrates, fat and protein. This product is also vegan and vegetarian-friendly and the coconut in the capsules can potentially help to raise the levels of good cholesterol in the body. If you would like to learn more about this product, read the rest of this review below. 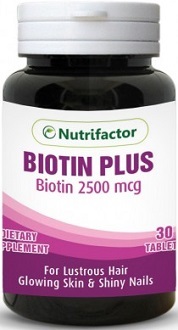 Biotin helps your body to convert nutrients into energy by helping your body to effectively metabolize your food. 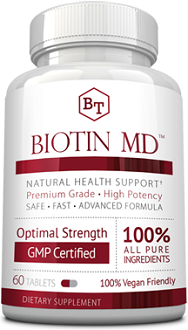 This vitamin is known for improving the infrastructure of keratin, which is an essential cornerstone when it comes to the production of healthy hair, nails and skin. Coconut Oil is one of the most highly saturates fats that has multiple benefits. Coconut Oil is known for reducing inflammation in the body and can also be beneficial in treating acne. Its antibacterial properties are also beneficial for your overall health. This product has no fillers and binders. The manufacturer’s website advises to take one tablet daily. This can be taken anytime during the day. However, there is no mention if this tablet is best taken before or after meals to ensure optimal effects. If you are under the age of 18 or you are pregnant and breastfeeding then it is recommended that you speak to a healthcare practitioner before taking this supplement. You can buy this product directly from the manufacturer’s website or you can buy it from Amazon. One bottle, containing 365 tablets will cost you $28.97. Currently there are no discounts available regarding this product, and we were also unable to find any wholesale options or bulk purchase markdowns. Although this product is fairly priced, seeing as it will last you about a year we feel loyal customers are not being rewarded when faithfully buying this product. This product does not come with a standard guarantee policy, however you are able to withdraw from your purchase within 14 days of buying this item. This only applies to products that have been bought directly from the manufacturer’s website. You will be refunded except if you have used the item excessively in which case you will have to still pay for the item and the return shipping costs. In comparison to other leading manufacturers this refund policy is not really that competitive. We like the fact that this product is easily accessible through the manufacturer’s website and through Amazon. We also like that it is suitable for vegans and vegetarians and that it is relatively affordable. However, compared with other leading manufacturer’s loyal customers are not being rewarded and given discounts. There is also not a competitive guarantee policy put in place to ensure customer satisfaction and peace of mind.